As in years past, manufacturing continues to be the main economic driver in Northwest Georgia. The region’s long tradition as a national leader in creating carpet and floor coverings, coupled with a trained workforce, is attracting new companies to the area and convincing established ones to expand. One of the largest announcements last year came from Whitfield County, where South Korean company Hanwha Q CELLS Korea is investing $150 million to create a 360,000-square-foot plant that will employ more than 500 workers making solar panels. The company is the world’s largest solar panel manufacturer. In addition, Polk County’s longtime defense contractor, Meggitt Polymers and Composites, continues work on a $30-million expansion of its existing plant. When finished, the facility will add 211 jobs to its current 1,000-person workforce making aircraft fuel tanks. Gordon County flooring products manufacturer Mannington Mills will be growing its workforce by 200 new jobs when it completes a $42-million expansion into a new building by 2021. In Bartow County, Loloi Inc., which wholesales rugs and home furnishings, will bring 198 jobs to a distribution center. Toyo Tire North American Manufacturing Inc. will hire more than 150 people for administrative, production and support positions in its new $138-million facility, says Melinda Lemmon, executive director of the Cartersville-Bartow County Department of Economic Development. Dade County’s Vanguard Trailer manufacturing operation is increasing the number of its employees by 95. Retail is also growing to support the manufacturing. In Catoosa County, a new Publix grocery store has brought 140 jobs to the community. A Food City is also generating additional retail jobs. More industry is expected following the opening last August in Murray County of the inland Appalachian Regional Port (ARP), with its direct rail connection to the Port of Savannah. To welcome this new industry, Murray County is creating its first industrial park. The county has also welcomed PolyTech Fibers, which manufactures recycled polyester fibers and will employ 112 people. Container Maintence Corp., with its $5-million investment, will be repairing and storing shipping containers in Murray County. The company will initially hire 20 people but will increase its workforce as the inland port becomes busier. Illya Copeland, executive director of the Murray County Industrial Authority, says a bedspring manufacturer is locating to the county, bringing an initial 20 jobs and making a $2-million investment. The ARP is proving to be an asset for businesses in nearby Whitfield, Gilmer, Gordon and Floyd counties, officials say, as it provides a direct 355-mile rail link to the Port of Savannah. “It means a lot to our companies to be able to get their products to the port so efficiently,” says Kathy Johnson, president and CEO of the Gordon County Chamber of Commerce. Interest in using the inland port was so high in Floyd County that a port official met with industry leaders to explain how it works, says Ken Wright, director of business and industry services at the Rome Floyd Chamber. “We have a huge Lowe’s regional distribution center, and they’ve taken full advantage of the [inland] port,” he says. Automotive suppliers and food-related companies in Floyd County also use the shipping facility. In most every county, public officials have invested in college and career academies, partnered with technical and traditional colleges and set up apprenticeship and internship programs with interested companies. The goal is to determine what skills a business needs in its workers and then to design cutting-edge courses and hands-on instruction to train them. All in an effort to meet a growing challenge in the region. “The biggest challenge facing our workforce in the here and now, I would have to say, is the lack of available workers,” says Stephanie Scearce, vice president of economic development for the Georgia Northwestern Technical College (GNTC). The college is stepping up to meet business needs. In fact, the responsiveness of GNTC to its workforce needs was one reason Carlsen Precision Manufacturing, a Canadian company that manufactures custom metal hinges, opened a plant in Floyd County, says Steve Caslick, vice president of operations. The Georgia facility hires workers trained as tool-and-die makers, machinists, mechanics and electricians. When the technical college said it would add a program to train tool-and-die makers, Carlsen officials decided Floyd County was the right fit. Caslick says the plant will go from seven to 20 or more jobs as the company expands its operation. A trained technician out of high school can start at Carlsen making $15 an hour. In Gordon County, the training – or at least, the realization that such resources are available – begins early. The Gordon chamber facilitates Future Fest, a daylong event that annually gives middle school students from city and county schools interactive experiences to learn about career possibilities with local industries and businesses. GNTC hosted last fall’s event, which drew more than 600 kids to learn about careers in healthcare, banking, manufacturing and more. “We like to say we take them from cradle to careers,” says Johnson. Calhoun City Schools start talking future work and career with children as young as Pre-K. Some of those children will easily find work in their home county, where Mannington Mills is expanding and China-based Complete Flooring Supply Corp. will invest $30 million into a hardwood floor manufacturing plant, creating 100 jobs. Likewise, Whitfield County is seeing a fruitful partnership between industry, local government and educational institutions, says Campbell. College and career academics – charter schools that advance workforce development in partnership with business, industry and community organizations – in local high schools attract hundreds of students. “There are lots of people in the education realm working with industry to fill positions today and tomorrow,” Campbell says. The county’s strong manufacturing sector – there are 14,000 jobs in floor covering alone – helped attract Hanwha. It also brought in Core Scientific, which plans a data center with 60 jobs; and Reagent Chemical and Research, which makes White Flyer clay shooting targets, with 38 jobs. Other industry-education partnerships in the area help with the workforce pipeline. Dalton-based carpet giant Shaw Industries sponsors high school robotics teams from the region. There are apprenticeships, internships and certification programs available through GNTC and Dalton State College in areas including machine maintenance and IT. And a local design, engineering and manufacturing camp is aimed at showing middle schoolers that “learning can be fun, and you don’t need to leave home to have a great career,” Campbell says. “I would have to say that everyone who wants a job has a job,” says Missy Kendrick, president and CEO of the Polk County Development Authority. Including at Norax Supplements, which built a new facility making dietary supplements and has seen its workforce rise from 75 to 95 jobs. The local college and career academy places high school students in work-based learning settings, where they are exposed to the business world and can obtain the soft skills that employers say many job applicants lack, such as critical thinking, communication skills and time management, Kendrick says. The Northwest Georgia Joint Development Authority markets Catoosa, Chattooga, Dade and Walker counties. Vice President for Economic Development Keith Barclift says his organization refers prospects to its four member counties and that he also works well with chamber officials in Chattanooga. Chattooga County has a new plant with 60 workers, Dixie Color, which will make color pellets to use in yarn for carpets and flooring. In Dade County, automotive supplier Gill Manufacturing added 50 jobs. Catoosa County saw the building of BMG Bakery, a facility whose 75 employees bake for Dunkin Donuts stores. According to Amy Jackson, president and CEO of the Catoosa County Chamber of Commerce, “We have work-based apprenticeships and internships, and great partners in industry,” such as Shaw Industries Group. Catoosa County Commissioners and the local board of education are partnering to build a new facility that will house the county’s 911 center, its economic development office and a college and career academy. The academy will offer different pathways for students to get an associate’s degree or certification in areas including healthcare, information and technology, law and justice and education while still in high school. Walker County, which is near the Tennessee line, hosts a part of the cycling leg for Chattanooga’s Ironman competition. It’s part and parcel with the county’s new slogan, Walker Rocks, which promotes its outdoor lifestyle and activities. Natural resources and scenic beauty abound in Gilmer County, and officials there hope they can persuade entrepreneurs to move into its new business incubator, CORE – Collaboration on River’s Edge – on the Coosawattee River, for the views as well as the infrastructure. Eventually, says Kent Sanford of the Greater Gilmer Joint Development Authority, plans call for bringing in a STEM program for children on the incubator’s second floor and coordinating with the Boys and Girls Club. In Haralson County there’s been new growth in retail and fast food restaurants, as well as renovation in downtown Bremen and Tallapoosa. Two manufacturers are considering adding second shifts, and a 19,000-square-foot industrial building is being rehabbed to sell, says Eric McDonald, president and CEO of the Haralson Chamber of Commerce. Through partnerships among business, city and county officials and education, the Northwest region is ensuring a workforce ready for the manufacturing jobs of today and tomorrow. Rebekah Abrams recently opened her home décor and furniture shop, White Tulip Market, near the Silver Comet Trail in Rockmart. It’s located in a renovated building within walking distance of her family’s home. For years the shop was in a booth in a Woodstock antique mall, so the larger space allows Abrams to carry merchandise from local vendors as well as her own home décor items. David Bridges believes Walker County rocks – and rolls. As the owner of Battlefield Bicycles since 2016, he rents, sells and repairs bicycles and bike trailers for folks wanting to peddle the 5,000-acre Chickamauga Battlefield, the country’s oldest and largest commemorative Civil War site. Bike routes take cyclists through the battlefield and into the historic town of Chickamauga. • Hanwha Q CELLS Korea, a South Korean company, is bringing more than 500 jobs to Whitfield County, where workers will make solar panels in a $150-million, 360,000-square-foot plant. • Loloi Inc., a wholesaler of rugs and home furnishings, will bring nearly 200 jobs to Bartow County in a $30-million distribution center. • Also in Bartow County, Toyo Tire North America Manufacturing Inc. will hire more than 150 people for its new $138-million facility. The company manufactures and sells radial tires. 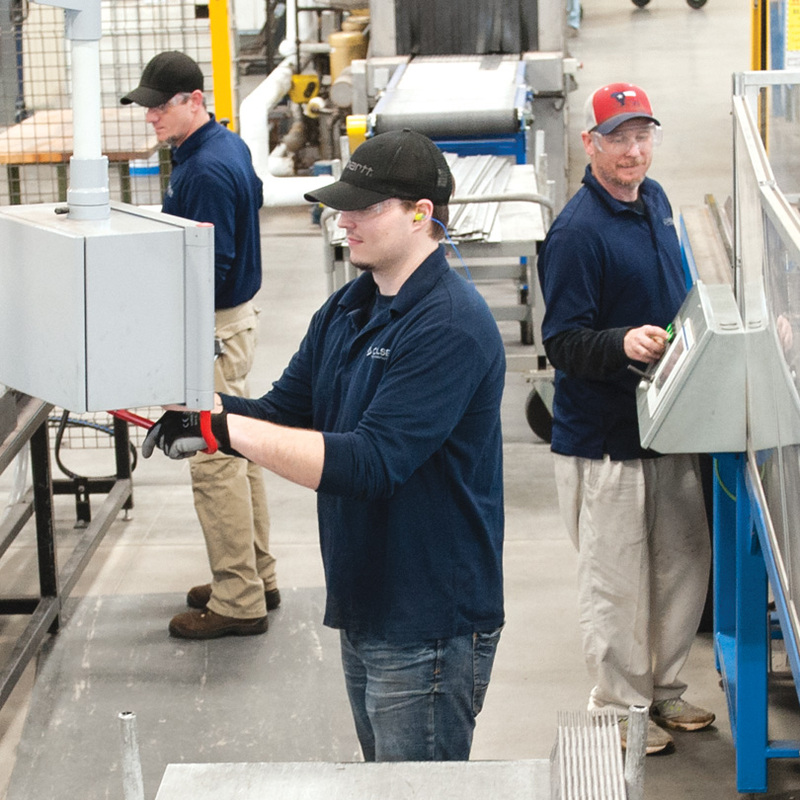 • A $42-million expansion into a new building at Gordon County’s Mannington Mills will add 200 new jobs to the company’s currently 700-strong county workforce.